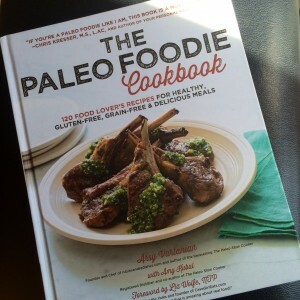 The Paleo Foodie Cookbook Review and Giveaway! If you’ve read my article What “Paleo” Means to Me, you’ll know that I see community as one of the biggest draws to eating a healthy diet. To make and share a meal with friends is truly one of the best pleasures in life. But if you have food sensitivities, this can be hard. You need to watch out for hidden grains or gluten, and the whole experience can become a lot more stressful. Well, Arsy Vartanian, the author of The Paleo Foodie Cookbook makes eating with a grain or gluten sensitivity a breeze. Better yet, she makes it a delight. This cookbook is one that will be on your shelf for decades, with the pages worn and dog-eared, food splatters and all. That’s the sign of a good cookbook – one that looks like it’s been in the kitchen for your whole life. The book starts with a brief introduction to a Paleo/Real Food diet from Amy Kubal, a wonderful Registered Dietitian who I’ve had the pleasure of working with. That means you can gift this book to someone who isn’t quite familiar with Paleo and they’ll still hear the why behind a real food diet. Up next are the appetizers, a delicious array of foods perfect for a snack at home to bites you’d be proud to bring to any party. Some of my favorites include pancetta-wrapped figs with walnuts (YUM), sardine spread (nutrient-rich goodness), sweet potato salmon cakes (actually a wonderful breakfast! ), and spicy sausage-and-walnut-stuffed mushrooms (is your mouth watering yet?). Salads can get a little boring if you’re constantly eating the same ones over and over again. Luckily, The Paleo Foodie Cookbook offers a plethora of salads to choose from, from the Fig, Pear and Prosciutto Salad; to the Curried Cabbage Salad; all the way to the Roasted Bone Marrow with Arugula and Parsley Salad. You’ll never be bored of salad again. Who doesn’t love soup? Not only is it such a comfort food, but it’s one of the most nutrient-dense foods you can go for. Personally, I love creamy soups so the Curried Chicken and Butternut Squash Soup sounds like heaven. The Slow-Cooker Hawaiian Oxtail Soup looks amazing, and I’m always a sucker for something I can throw in the slow-cooker! I’m always on the lookout for new side dishes. Food variety is so important for a healthy diet, so I always encourage my clients to eat as many different foods as possible and not get stuck eating the same foods again and again. The side dishes in this book definitely inspired me! The chorizo cauliflower rice sounds like an amazing pop of flavor – I can’t wait to try it. I also love brussel sprouts and am always looking for new ways to cook it. Arsy’s Shredded Brussel Sprouts with Pancetta…I can’t even contain myself they look so good. This section is awesome. I love learning how to make sauces from scratch because they can truly make or break a dish. I’m dying to make the Pistachio Pesto and the Four-Herb Spicy Chimichurri! I also have been using canned chipotle peppers in adobo sauce to make sweet potato chipotle soup, but now with Arsy’s recipe to make it myself I’m going to do just that! This cookbook is definitely a keeper, which is why I’m so happy to give one copy away to a lucky reader! Enter below and good luck! https://kelseykinney.com/wp-content/uploads/2014/03/The-Paleo-Foodie-Cookbook-Review-and-Giveaway.jpg 1413 1413 Kelsey Kinney MS, RD http://kelseykinney.com/wp-content/uploads/2016/10/website-.png Kelsey Kinney MS, RD2014-03-25 15:31:002016-11-17 04:37:49The Paleo Foodie Cookbook Review and Giveaway! Sign up for my newsletter and get my 5S Digestion Optimization Protocol FREE! You'll receive exciting updates on new articles, podcasts, offers, and promotions.